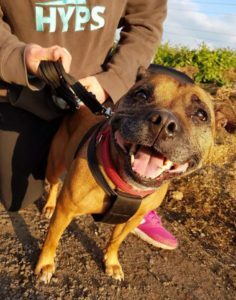 Sunday the dinky red Staffy is a little bundle of love who adores people and is fantastic with children – she is very gentle with children and knows not to jump up etc. 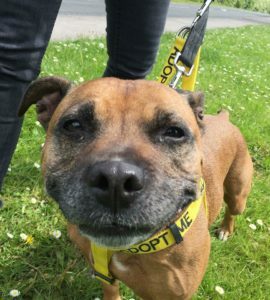 She is 6-7 years old, full of energy with a big Staffy smile! Sunday is very well behaved around the house – she is fully housetrained, doesn’t chew and is fine to be left for a few hours. 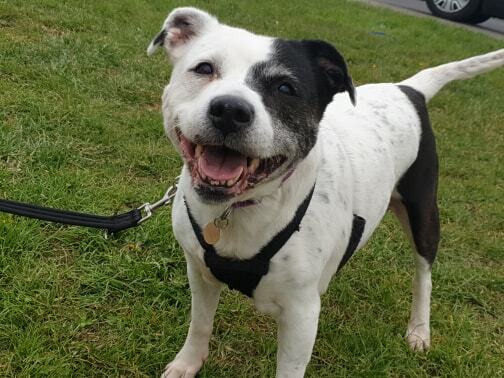 Sunday is looking for a home who know and love her breed, she does not get along with other dogs and will need a savvy owner to keep her away from other dogs when out walking. Please do not let this put you off little Sunday as she really is the sweetest, softest girl with people. She is finding kennels very stressful and needs to find her dream forever home ASAP, she really is a little cracker with such a big personality and so much love to give.